This is a PRIVATE tour with a PRIVATE tour guide. Only you and your group will be on the tour or in the vehicle - no other guests. The itinerary below is suggested, but you are free to customize to your interests with your tour guide on the day of the trip. Our city tour is perfect for both first timers and regular visitors as we visit the traditional areas of Vallarta's down town and old town. 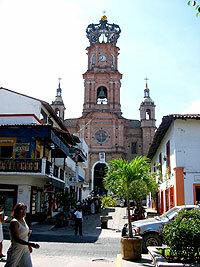 We will visit the main sights of Puerto Vallarta's main square including the historical church, a traditional silver shop and tile factory with artisans onsite. We will take a short drive out to Mismaloya, remembered for being the setting for the famous movie "Night of the Iguana" with Richard Burton, stop at a local hacienda for a taste of Mexico's favorite drink, tequila, and take lunch at a riverside restaurant (optional). A very nice first look or overall view of Puerto Vallarta - especially popular with cruise passengers! Runs: Daily at 9:00 AM, except for cruise passengers, where start time is 1 hour after your ship arrival time. If you need a different start time, please contact us, we can usually accommodate. Departs From: Your hotel front door (in most cases) or for cruise passengers, pick up at the cruise ship pier is available for $20.00 USD paid in cash the day of your tour. This works out to as little as $29.00 Per Person! Our prices are applicable for hotels at Mismaloya and Bucerias.